She's six years old, Down Syndrome, and lost. Only her kidnapper can save her. The plan is simple: kidnap the daughter of Senate candidate Richard McClaine, take the money and run. Nobody gets hurt, the kid goes home alive. Twenty-two-year-old car thief Kelsey Money thinks it's the worst scheme her boyfriend Matt and his drug-fueled brother have ever come up with. But Matt's the only one Kelsey's ever loved, the only one she's ever trusted. Then she discovers the part she wasn’t told - that six-year-old Holly isn’t going home alive. So, Kelsey makes a decision. And some decisions can never be undone. Elizabeth McClaine can't even tell the police what her daughter was wearing when she disappeared. Soon after Holly was born with Down Syndrome and a cleft palate, she was placed in the care of a nanny while her mother battled postpartum depression. But when Elizabeth learns the detective on the case has already failed one kidnapped child, she cannot fail hers. The clock is ticking. Both women have twenty-four hours to find Holly because in twenty-five, she’ll be dead. 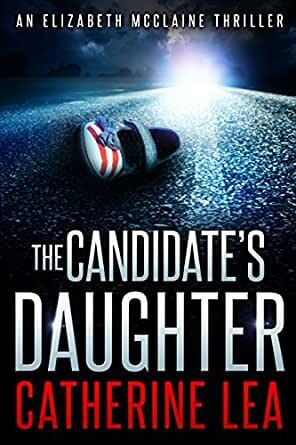 The Candidate's Daughter and its sequels Child of the State and A Stolen Woman are additions to the great action and character-driven mystery and suspense thrillers in the tradition of J.D. Robb, Faye Kellerman, and Mary Higgins Clark. "Absolutely spellbinding ... completely unputdownable." - Karen Dionne, author of THE MARSH KING'S DAUGHTER. "...political suspense of the best kind." "...makes you want to stop and read it all over again." First of all, thank you for your interest in my books. You’ll find in many of my books, I include characters with intellectual or physical challenges. Added to this, I wanted to write twisty crime thrillers with complex characters and surprise endings, so I created the Elizabeth McClaine thriller series. So, who is Elizabeth McClaine? Strong-minded Elizabeth uses her connections to the local government in her home town of Cleveland, Ohio to find justice for those who need it. The stories involve kidnappings and heists, corporate greed and murders and storylines that will keep the pages turning onto the wee hours. What gives these stories heart? Real, believable characters from Elizabeth herself to Holly, the cherished only daughter born with Down syndrome. Having loved and cared for a disabled daughter myself, I know the joy and the challenges caring for and loving a disabled child can bring. Therefore, from book #1, Holly brings Elizabeth a real sense of purpose and a desire to help those in need. The books in the series are sequential, but each is a standalone, so you can read them out of order. If you have any questions, you’ll find my page on Goodreads. "A thriller with heart." - Sara J. Henry, Anthony-award winning author of A COLD AND LONELY PLACE. "Absolutely spellbinding ... completely unputdownable." - Karen Dionne, internationally published author of BOILING POINT and FREEZING POINT. "...a cinematically-imagined ending that would do any Hollywood Blockbuster proud." - IndieHeart reviewer, Jill Nojack. I actually enjoyed this book though it was a bit far fetched in some parts. Enjoyed it, good suspense story. I've pretty much given up on self-pub books. Too much crap to wade through to find the few gems among them. However, when several people you know start talking about one, it may well be worth checking out. That's the case with The Candidate's Daughter. There are scenes in this book that stretched my suspension of disbelief to the breaking point. Sadly, those scenes didn't do a whole lot to advance the plot and could have been handled better, or cut altogether, but they are short and passed quickly. And, while typos and inconsistent formatting don't bother me all that much, be prepared if they bother you; sadly, there are quite a few to trip over. Okay, that's the negative stuff out of the way. There are two main characters in this; Kelsey and Elizabeth. Ms Lea has a good grasp on Kelsey, not so much on Elizabeth, leastwise not in the beginning. The first chapter, from Kelsey's POV, hits the ground running and, throughout the book, Kelsey never slows down much. These are fairly well crafted chapters, hard hitting, fast, full of obstacles to over come and tension enough to snap a steel bolt. The second chapter introduces Elizabeth and Richard, the kidnapped girl's parents. The first few visits with Elizabeth, with or without Richard, are dense and plodding and a bit of a chore to wade through. However, Ms Lea shakes off her lethargy about a third of the way in and, while they never reach the pace of the Kelsey chapters, they do take on an important, character-arcing life of their own. You know you've become wrapped up in a story when you start talking aloud to the characters: "Kelsey Kelsey Kelsey, you are not as stupid as you think. Matt is the stupid one, can't you see that?". And there was more than one moment when I wanted to smack Elizabeth upside the head and tell her to get a grip. Which, satisfyingly enough, she does. This is a good story with a good pace, despite the sputtering start. And the end, well, let's just say you should hold on to your hat. I sat on the edge of my seat -- biting my nails to the quick -- and could not stop turning pages in this fast-paced, action-packed thriller! I seldom read this genre because, in my opinion, many thrillers are flat and lack human emotions. That's not the case with this book. The writing is excellent and the action scenes left me breathless, but my own emotions were often at the breaking point. The Candidate's Daughter is a touching story of love, with true-to-life characters that make you keep reading to learn what happens to all who came together in their search for justice. My hat's off to the author: It takes a very special person to write a book like this, which I'm proud to recommend to my friends. The ending of The Candidate's Daughter packs a punch you won't soon forget! Debut New Zealand author Catherine Lea has created a cast of mostly despicable yet memorable characters that stayed with me long after I finished this fast-paced thriller set in Cleveland, Ohio, USA. Two women from opposite spectrums of society don't know each other and yet they share a common goal: that of saving the life of Holly, the special needs child who was born to one of the women and now finds herself the unfortunate kidnapping victim of the other woman. Panic, confusion, and desperation force both women to face the reality of their self-centered lifestyles and to rescue the child who cannot survive a 24-hour ultimatum without their intervention. Well done, author, and thanks for the entertaining read. I'm usually a slow reader, and there are very few books I've found I couldn't put down. This has been one of them. A real page turner, I took it wherever I went for 2 days until I was done. I liked the strong but imperfect and interesting female characters. Holly's story, and her relationship with her parents and her kidnappers is endearing and has a lot of credibility, and is probably what sets this book apart from others in the same genre.